This chapter examines the unstated expectations people hold and the insidious problem of perfectionism. A case example as told by Erickson during one of his many seminars has been selected so that the reader can contrast his or her initial conclusions about Erickson’s work with the book’s analysis. The case report in this chapter will be elaborated on in further detail in Chapter 8. The narrative has been divided in this way to help illustrate the multidimensional nature of Erickson’s work. It is important to recognize that there is not just one point to be gleaned from each case example. As intended by Erickson, each story is a metaphor designed to communicate timeless lessons that are difficult to bind up in an explicit construct or theory. A man was brought to Erickson in a wheelchair, with arms and knees fixed to the chair. He was angry and cursed the fact that he had spent the last eleven years paralyzed by painful arthritis. He could move only his head and had some slight movement in one thumb. He was completely dependent on his wife, who dressed him, put him in his wheelchair every morning, then fed him, and put him to bed at night. All the while, he continued cursing about his unhappy life. The man went home absolutely determined to make his point. But, as he continued to exercise his thumb, he suddenly noticed movement in his index finger, the digit most likely to be affected by movement of the thumb. As the exercising progressed he became able to move more fingers. He became fascinated by this. Each new sign of progress kept him absorbed in finding out how many more little movements he could get out of his fingers. Then he became able to move his wrist, and then finally his arms. These exercises became the man’s method of passing time. Then, a year after his first appointment, Erickson gave him the task of painting a small cabin. The man responded by swearing as he informed Erickson that if he had any common sense he would not send a man with such limited movement to paint a cabin. Erickson persisted. The assignment took him about three weeks. By the end of the summer he increased his speed and was able to paint a stucco duplex in a week’s time. Following these accomplishments, he got a job as a truck driver. Next he decided he should join a fraternal order and was soon elected president of that order. During his ongoing work with Erickson, the man decided he needed a college education and went to college. Because of the seemingly incredible nature of this case report and most others described in this book, it is very important to pay close attention to what was actually achieved and what was not. It is a mistake to be seduced by the idea that Erickson’s use of hypnosis produced some sort of magical cure. Wonderful as the outcome was for the man with arthritis, it is essential to recognize that he was not cured of arthritis. On the contrary, there remained certain circumscribed moments in which his problem was just as intense as when he first came for therapy. The residual arthritis was so debilitating that he was again temporarily confined to bed. However, the therapy was highly successful in that he was no longer an invalid. As will often occur, one small gain can lead to other unexpected outcomes and even cascade into completely unanticipated benefits. As with the case of the man with arthritis, Erickson admitted that he initially had no idea the patient would make such remarkable progress. The man had been putting most of his energy into making the problem worse. Once that energy was shifted toward identifying unrecognized possibilities, seemingly impossible circumstances were transcended. If Erickson had attempted to cure the man, he would most certainly have failed. Instead he hoped that some amount of good could be accomplished. 1 Because somatic pain is a warning signal that something is wrong with the body, the psychological treatment of pain is appropriate once the causal factors are known and medical treatment is under way. The second major point is that living requires effort. This is often overlooked in a culture of modern conveniences. In addition to being imperfect, people need to work hard in order to function well. Healthy muscles require constant exercise. Healthy brains require ongoing stimulation and effortful processing. Healthy families require constant attention and involvement. In most of his clinical work, Erickson rarely used words or phrases that implied a passive role for the patient. He found stimulating ways of encouraging patients to be actively engaged in their own healing processes. Having grown up on a farm, he fully appreciated the meaning of, “You must do your share of the work.” He understood the feeling of satisfaction that comes after a hard day’s toil. Accordingly, Erickson put a great deal of time and energy into each clinical case. He kept meticulous notes, writing down everything that was said during a session. Then he planned and reviewed every word and action that might occur in following sessions and what impact it might have. In some cases, he drove to patients’ houses in order to better understand the setting from which they came. What this meant was that Erickson often spent more time preparing for a session than in the sessions themselves. Erickson’s opinion was that the results of each problem-solving endeavor will be proportional to the amount of effort invested in finding a solution (Hughes and Rothovius, 1996, p. 236). In the case of the man with arthritis, Erickson put him to work first exercising his thumb. This eventually progressed into painting houses. Engaging the patient in productive effort, as small as it initially was, eventually produced a profound effect. Similarly, Erickson taught other patients with severely debilitating pain to take advantage of moments when they are feeling better in order to be productive (Erickson-Klein, 1990). Regardless of the disability or state of health, a lack of effort results in lack of progress. Perhaps this is why many clinicians wisely avoid enabling passivity by adhering to the maxim, “Never work harder than the patient.” As Erickson (1952/2001b) explains, “Whatever the part played by the hypnotist may be, the role of the subjects involve [sic] the greater amount of active functioning- functioning which derives from the capabilities, learnings, and experiential history of their total personalities” (p. 27). Because the active involvement of the patient is so important, the clinician should avoid fixating on what the patient must stop doing. Growth-oriented therapy focuses on what the patient can start doing. Next, it is important to recognize that life involves a process of reciprocal determinism. The world of human ideas and experiential reality is impacted by the physical universe. At the same time, human thinking provides impetus for the events of the external world. Erickson alluded to this dynamic while referring to the centuries- old philosophy, “As a man thinketh, so he is” (Erickson and Rossi, 1979, p. 262). In the case above, the man was given a new perspective on arthritis. Erickson explains, “Although he still limps a little, he has a nice healthy attitude.” In other words, the man learned to think better of his situation and adapt to his physical limitations. Erickson used this case to illustrate the importance of accepting and finding use for the patient’s disability. This is the essence of adaptation and resiliency. It can be said in very general terms that where adaptation and resiliency end, death begins. In order not to be immobilized by life’s challenges, a person must have the capacity to accept undesirable circumstances. This idea was communicated well by Tyler Hamilton, a cycling contestant in the 2003 Tour de France. During the first stage of the race, he was in a crash that fractured his collarbone. Despite intense pain he managed to complete the race and take fourth place. When asked how he was able to accomplish this remarkable feat, Hamilton said that he learned to accept the pain. Once he stopped struggling against it he was able to make the necessary adjustments in posture, balance, and thinking. This is perhaps what Erickson meant when he described rigid inflexibility as the most general problem to be dealt with in psychotherapy (Zeig, 1980). Flexibility and adaptation are as essential to resiliency as acceptance is to learning. If a person continues to struggle and fight intractable changes to the environment, mind, or body, energy is wasted and recovery is hindered. For instance, Betty Alice Erickson recalls the case of a five-year-old boy who was traumatized after witnessing a terrible automobile accident. The little boy had seen a man lying on the street with a severed leg. It left a disturbing image in his mind. He talked about it a great deal and drew pictures of the leg and the body. The unfortunate scene seemed to be ever present in his mind. The boy’s parents tried talking to him, explaining that automobile accidents were rare, and asked him to forget about it and no longer draw pictures of it. But the youngster remained fixated on the horrible sight. Betty Alice Erickson sought consultation so she could better understand the essential dynamics. Erickson told her that the little boy was faced with the possibility of his own parents suffering this catastrophe and, as little children do, was worried about his own future. These were feelings he would not be able to understand. Erickson indicated that dealing with these types of worries on a logical basis never works. He advised that the parents should take one of the pictures of the man with the severed leg, and admire it. They should let the boy know how well he had captured the sight of the blood. They should ask about details in the picture, such as, “Was that the right distance to have between the man and his severed leg?” The expression on the man’s face should be examined with the child‹and the boy praised for his accuracy in that as well. Then the child should be asked very seriously to draw a picture of the man after the doctors had helped him. “That little boy,” Erickson explained, “is looking for a way out of his impossible dilemma.” Doctors, at his age, were still categorized as supreme authorities who could do wonderful and amazing things. As Erickson predicted, drawing a picture of the man, after the doctors had helped, gave the child a sense of closure and the type of hope needed to live happily. You start building up in the patient a philosophy that allows him to accept some degree of failure. You suggest to your impotent patient that you regret exceedingly that no matter how well you succeed with him, you’re going to fail ten percent of the time. And you express that intense regret that he’s going to fail ten percent of the time and you regret it. But what you’re really telling him is that he’s going to succeed ninety percent of the time. Erickson often used this approach with a patient who was absolutely convinced he would fail. He phrased his statements in such a way that change suddenly seemed possible while still leaving some space for the acceptance of imperfection. Erickson would sometimes end a trance by stating, “All good things must come to an end.” This is one of the most profound dilemmas encountered by living creatures. Our reality is bound to a frail body that will eventually expire. As a person who had been crippled by polio, Erickson not only understood but also was a model of acceptance of human frailty. His response to this human condition is reminiscent of the biblical saying, “Your body is a temple.”Erickson’s therapy was one that always pointed to the goodness and importance of the body. As Erickson recognized early in his career, “One need only call to mind a small boy proudly displaying his muscles to realize how important a sense of pride, trust and confidence in one’s own body is for a normal healthy outlook upon life” (Erickson, 1941/2001a, p. 4). In this way, he defined the individual as the unit of change in psychotherapy and a positive clinical outcome as, “the opportunity of directing every intensity of the personality into making use of the body. This serves the purpose of helping you bring about therapeutic results” (Erickson, 1957). The implicit element of this philosophy is the social context in which the change occurs. Although the individual may be the unit of change, it is often the helping relationship that ignites the transformation process, resulting in greater hope and increased resiliency. Such help may come from one person, such as a parent, therapist, or good friend. Or there may be a group of individuals invested in helping one another, such as in group therapy, family therapy, or community support groups. Each of these has its own unique benefits. While explaining the transformation of the man with arthritis, Erickson simply commented that he knew the man could move his thumb and that the thumb was connected to other bones in the body, which were in turn connected to other bones, and so on. In other words, as long as there is life and movement, some part of the body can always be brought into play against the disability. But this activation of internal resources will not occur as long as the latent potential remains unrecognized. Unfortunately, it is not uncommon for those in distress to isolate their efforts to the activation of the part of the body formally assigned a specific task. If that effort is not successful, then eventually the person decides that the situation really is hopeless and thus surrenders to disability. However, from his own experiences with polio, Erickson recognized that other parts of the mind and body can compensate for even a substantial loss of ability. Before coming to therapy the man could not move his index finger through a conscious activation of those muscles. However, while wiggling his thumb he was able to produce movement in the finger attached to it. This discovery highlighted, in microcosm, the compensatory method of using muscles that had some strength to produce movement in muscles that had atrophied. Under Erickson’s guidance, the man took all of the energy that had been wasted on profanity and put it into exercising his thumb, fingers, and arms, and then into full body movement. In this way, the progress was cumulative. He discovered that his situation truly was not as impossible as he had once believed. This case report illustrates that there was no “magic” in Erickson’s work. 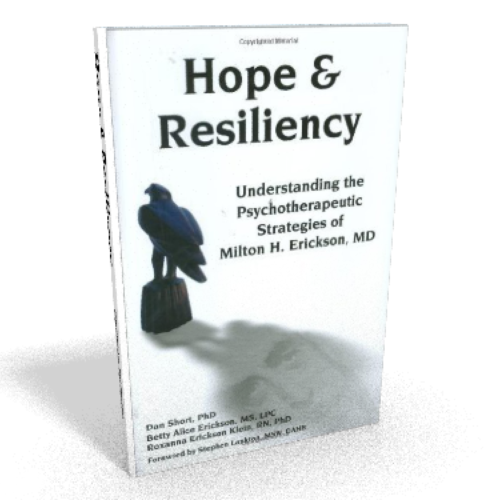 Instead, it was the activation of hope and resiliency that resulted in a beneficial clinical outcome.